As of 2014, WordPress powered over 74.6 million websites, and it’s by far the most popular one-click install on our servers. With that in mind, here are our tricks and tips for increasing subscribers and meeting your mailing list goals using your WordPress website. It doesn’t matter how beautiful, interesting and useful your emails are if no one ever sees them. Luckily, WordPress is a fantastic platform for subscriber sign up options as there are so many free plugins and widgets available. Try to select tools and services that exist outside of WordPress in some form, so that if you/your client decides to move to a different platform in the future, you can still keep all your data, emails, reports and so on without interruption. A popular option is to integrate a form at the end of your posts, or set up a pop up that appears on the screen after a set period of time. This encourages people to join your list so they don’t miss any new posts, and works by requiring the user to make an immediate decision. There are hundreds of plugins in the WordPress theme directory that will do this for you, including SumoMe’s tool and Sticky email opt-in widget. 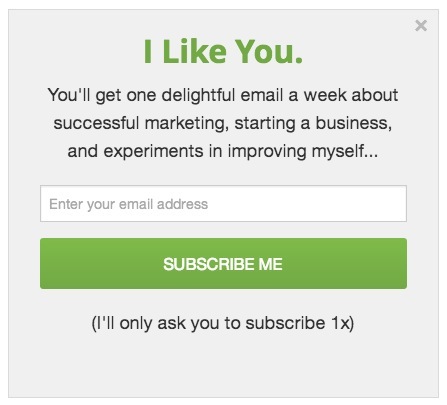 In addition to a standalone subscribe option, you can also encourage subscriptions by making them part of a process. For example, if you’re using WordPress for ecommerce, consider adding a subscription form after the order confirmation page or as a checkbox within the order process. Mailing list subscription can easily and effectively be added into any sign up process, so even if your visitors are just registering to comment, it can provide a good opportunity to subscribe. A great plugin for this is Comment redirect, where you can automatically send visitors to a subscribe form after they’ve commented on your post. Giving visitors a good reason to subscribe is vital, so offering free downloads, exclusive content, offers, and discounts out of the box is a great incentive. As with any other element of your website and email campaign process, A/B testing (or split testing) is vital. Take a look at our beginner’s guide to A/B testing to help you get started. As with every other feature of your website, it’s a question of balance. Avoid pulling your visitors in too many different directions and overcrowding your pages with too many messages by deciding what’s the most important action for them to take at a given point. This might be subscribing to your emails, directing them to a sales page, social sharing, etc. – but not all the things all the time. If you’re keen for your visitors to complete multiple actions, try to make them a chain of logical steps that are easy to complete and won’t leave them feeling overwhelmed. Joining your mailing list is likely to be a middle step in the chain (i.e. they’re engaged enough with you to want your updates, but they probably haven’t bought from you yet). Whether it’s via a simple email forward, social media, or even traditional word of mouth, if your emails contain valuable or interesting content, people will want to share them. Encourage this with incentives for extra free downloads, sneak peeks, and simple calls to action. There are fairly strict laws governing email sending within the EU, and unlike the US, your subscribers need to accept and then confirm their subscription to your email marketing list (also known as ‘double opt in’). You can find out more by reading Anti-spam laws and the EU and Anti-spam laws and the UK. When you’re choosing a service for your mailing list, make sure that they have an option for double opt in and that you activate it in order to comply. Our email marketing service is set to comply with all EU and UK anti-spam regulations out of the box.